Rick Robbins was born in 1946. At age eight Rick took violin lessons and later took up the Cornet. In 1962 Rick went to the Stockbridge School in Interlaken Ma. There he had his first taste of folk music and bought his first guitar after listening to a Jack Elliott record. " We were listening to Woody Guthrie, Leadbelly, Sonny Terry, Brownie Mcghee, Cisco Houston and Jack Elliott". Alice and Ray Brock turned Rick on to who Woody Guthrie was. In 1965 Rick and Arlo Guthrie hit the road looking for Woody & Cisco's footprints. " We found some footprints, and heard a lot of stories, but best of all we were out there playing the songs that Woody and Cisco and all those guys like Leadbelly left behind. These songs are real and worth handing down". Rick was on the road with a guitar up until 1978 when he settled down to build houses and learn architectural design. " I stopped touring the country, but I never stopped picking and singing , the music was always there". 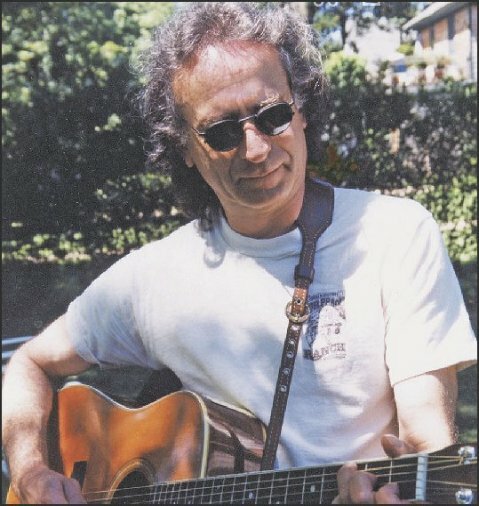 One day in 1995 Rick was trading his construction skills on a music studio for renowned sound engineer, Ron Bach,in exchange for some recording time to preserve a few treasured folk songs for his family when award- winning blues woman, Rory Block, happened to be listening in and loved what she heard. She added a few vocals of her own and urged Rick to record a whole album. Making it all happen took over two years, and in 97' Rick was back into the music with the release of his first CD "Walkin' Down The Line". The album is produced by Rory Block, and features guest appearances by Arlo Guthrie, Ramblin' Jack Elliott, John Sebastian, Eric Weissberg, Larry Campbell and Rory Block. In 2001 Rick released his second album, Rick Robbins with Rory Block "Don't Deny My Name" produced again by Rory with guest appearances by Garth Hudson (The Band) John Sebastian ( The Lovin' Spoonful ) Larry Campbell ( Bob Dylan's "Never Ending Tour Band" ) and Steve Ide ( Arlo Guthrie's "Shenandoah" lead guitar player). In 1997 Rick picked up where Bruce Pratt left off as the legendary Ramblin' Jack Elliott's traveling buddy and guest performer on what is now known as the annual "Mud Season Tour". This year will mark the tenth year of ramblin' around to some of New England's best folk venues. This February 2007 Rick is releasing his first all original material studio recording of ten new songs entitled "time & gravity" produced by Rick Tiven and Rick Robbins. "Walkin ' Down The Line" has had extensive radio air play all over the country, and was number 10 on the Top Albums and Songs for April 1998 ( Compiled by Richard Gillmann from FOLKDJ-L radio play lists). "Robbins' gritty voice delivers chestnuts like " Handsome Molly" and " Yankee Clipper" with the authority of lifelong familiarity "......" What allows singer / guitarist Robbins to stand shoulder -to-shoulder with veteran vocalists and instrumentalists like Block,Elliott, and Weissberg is his obviously deep and abiding commitment to the material". The Berkshire Eagle . . . . . . . .
Needless to say I got no financial interest in this recording ! Wish I had!